Whether dad is a true carnivore, vegetarian, or just careful about his cholesterol, these mouthwatering burgers are Father�s Day pleasers for dads of all tastes. 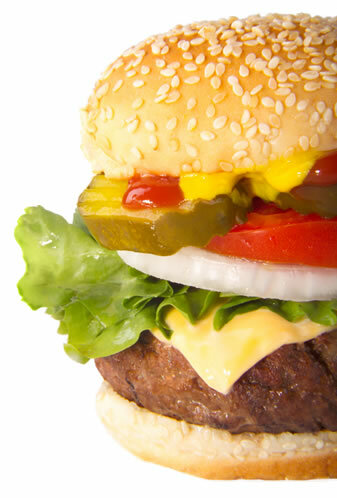 Celebrate the big guy�s special day by grilling up a burger made especially for him. Be sure to glance through these helpful burger tips before you heat up the grill. 1. For flavorful and juicy burgers, choose the best ingredients and ground meat that is 85% fat or higher. The fat keeps the burger moist and helps retain the flavor. 2. Be gentle when mixing, overworking the mixture will result in tough burgers. 3. With poultry or fish, avoid a dry burger by adding a small amount of olive oil. 4. 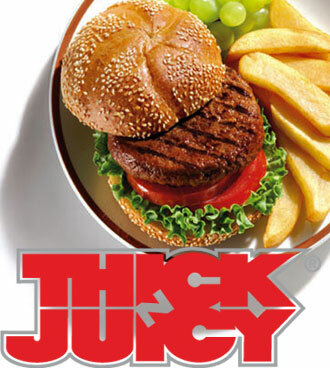 For even cooking, keep patties around � of an inch thick. Use a thumb to make an indentation in the center of the Pattie to keep burgers from swelling. 5. Always cook burgers thoroughly (160� F or 170� F for poultry). Cut salmon into strips, cutting the strips crosswise, and chopping the fish until well minced. Remove any remaining bones. In a large bowl, mix the minced salmon with breadcrumbs, red onion, Dijon mustard, horseradish, and eggs. Season with rosemary, salt, and pepper. Chill for 30 minutes to 2 hours in the refrigerator. Form the salmon mixture into burger patties. Lightly coat each patty with olive oil. Place salmon patties on the grill and cook for 4-5 minutes on each side. Serve on a french rolls or whole-wheat buns. In a large bowl, mix the ground beef, blue cheese, chives, hot pepper sauce, Worcestershire sauce, pepper, salt and mustard. Cover and refrigerate for 2 hours. Preheat grill for medium-high heat. Gently form the burger mixture into 12 patties. Oil the grill grate. Grill patties for 5 minutes per side or until cooked through. Place the onion cuts and mushroom caps, smooth side up, in a shallow dish. In a small bowl, whisk together vinegar, oil, basil, oregano, garlic, salt and pepper. Pour over the mushrooms. Let stand at room temperature for 15-20 minutes, turning twice. Preheat grill fro medium-high heat. Brush grate with oil. Place onions on the grill first as they need to cook longer then place mushrooms on the grill beside onions, reserving marinade for basting. Grill for 6-8 minutes on each side, or until tender. Brush with marinade frequently. During the last 2 minutes of grilling top mushrooms with onions and then top with cheese. Serve on whole-wheat buns or onion rolls and top with lettuce tomato and aioli sauce. • Love Dad a "Brunch"